1. Get your child an eye exam before school starts: Problems with your children’s vision can be detected through a routine eye exam. It’s important to correct these issues, such as nearsightedness or farsightedness before they create more serious complications such as difficulty learning or the development of recurrent headaches. 2. Kids should wash their hands regularly: According to a study published in the American Journal of Infection Control, more than 164 million school days are missed due to the spread of infectious diseases. Three million of those missed days are the direct result of acute conjunctivitis, also known as pink eye. It’s important to remind your children to wash their hands regularly and avoid touching their eyes as much as possible. 3. Ensure children wear protective eyewear when playing sports: Most eye injuries among kids aged 11 to 14 occur while playing sports, with nearly 35,000 incidents per year according to the National Eye Institute. Protective eyewear, such as goggles or a helmet-mounted eye/face shield, can drastically reduce the risk of serious eye injury. As parents, a great way to help is by setting a good example whenever you participate in sports. 4. Encourage kids to give their eyes a rest: With the school year in full swing, your children will likely be spending a lot of time with their nose stuck in books or staring at the computer screen. Over time, this can cause eye strain, headaches, blurred vision or even nearsightedness. Remind your children to give their eyes a rest every 20 to 30 minutes. It’s a good idea to minimize glare where they are working, as this can force the eyes to work harder than need be. 5. Purchase your children high E-SPF glasses: A lot of activities that kids participate in after school exposes them to the sun’s harmful UV rays. Over time, UV exposure can lead to a host of problems for the eyes, including the early development of cataracts. By purchasing protective, high E-SPF prescription glasses or sunglasses for your child, you’ll foster and encourage their good eye health years to come. 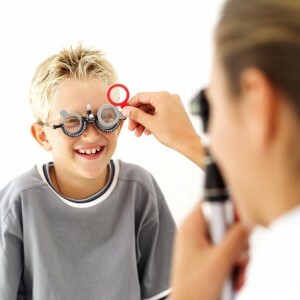 If at any time you suspect your child may be having vision issues, please consult your family eye doctor.